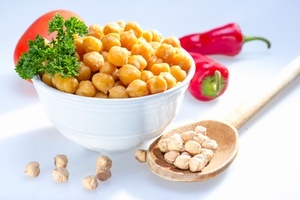 One of our favorite healthy snacks is toasted garbanzo beans. They are yummy, crunchy and you can adjust the seasonings to your taste. Today I’d like to share one of my favorite recipes using these chick peas with you. 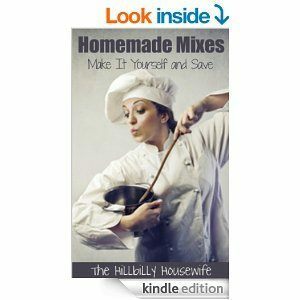 It’s from my latest Kindle Cookbook “The Thrifty Bean Cookbook: 35 Bean Recipes To Warm Your Heart & Your Belly “. Feel free to experiment with different combinations from what I am sharing below. In a large sauce pan, heat the oil over medium high heat. Once the oil is hot fry the mustard seeds until they begin to pop and then add the shallot and red pepper flakes and sauté until the shallot is soft. Now add the beans, cumin, turmeric, ginger, salt and pepper. Toast the beans gently over medium heat, moving them around constantly. Sprinkle cilantro over beans and serve. Ready to cook some beans? Not only are beans a great way to add high quality nutrients to your family’s diet, but they are versatile too. You can easily adjust flavoring or start out with a big pot of pintos to have with corn bread the first night, then turn them refried beans for bean burritos the following night. You can use them as a main dish by serving them over rice, with tuna or serve them as a side dish. Here are 35 savory bean recipes from simple frugal dinners to dishes you can make for company. 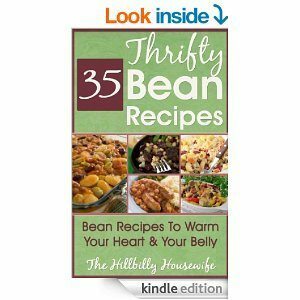 Get your copy of the Thrifty Bean Cookbook today and start cooking.